"298... 299... 300! That's 300 shards!" Nausicaa uses her muzzle to slide the last remaining shards, the golden pieces joining a larger pile on the opposite side of her mahogany coloured desk. The recently finished shine on the wood was so impeccable that she could see her face in it, and she'd made sure to tell the carpenter how pleased she was (in typical Nausicaa fashion, this had involved skipping around him singing "thank you" a million times!) with the work. With an ever-growing herd, there was no doubt she'd needed to fill out the interior more, and she'd done so with style. Much like a medieval castle, Nausicaa had hung various cloths from the walls, illuminated by the natural light streaming through the windows. Her palace, however, was much less stuffy. Each bed was peppered with pillows, cushions and throws of fantastic colours, eagerly awaiting foreign dignitaries or anyone else who should visit. Standing across from her now with his head bent expectantly at her was Undina's head builder, a mature but patient stallion known as Crewe. With wise eyes, he watched her nostrils move the shards over the desk, and nodded as she counted. Offering her a gentle smile, he bopped his head respectfully when she'd finished. "It was an honour to construct such a magnificent thing for you, your majesty." Prancing around the desk to his side, she nudged his neck affectionately, her friendship extending beyond all constraints of kingship -- they are old friends, after all. "I never thought you could make something so incredible, Crewe! It's really awesome. Telemakos has already found a nice place to sit on it, y'know!" With a giggle, the pair moved to the window. They were on the second floor of the Mirrored Sanctum, but what had been constructed was so central that all eyes were attracted to it. In the midst of the gardens, beyond dancing roses and singing peonies, a statue of white marble now stands. It is impressive in size, roughly equivalent to a mighty oak tree, with steps leading up to it and a small raised bench around it in order to leave offerings. The occupant of the pedestal is none other than the god Terra in his horse form, a sturdy Clydesdale watching his people with a certain warmth in his posture. "He looks fabulous. I wonder if the real Terra would like it?" Crewe frowns -- he's an atheist, and doesn't have time for the mythical. His world revolves around the living. But, to please his queen, he would not contradict her statement, and simply snorts in acknowledgement. Suddenly, with a flurry of noises, mostly squeaks, from the Queen herself, the office comes to life. "Crewe, can you bring me a raven please?" She manages to ask him before she's pulling out drawers and drowning in papers. "Of course, your highness. Can I be so bold as to ask what for?" "Oh." As abruptly as she starts, she stills once more, much like a storm at sea. Like a ostrich, her neck and head rising with a jolt out of the desert that is the paperwork in one of her drawers. "A party of course! Silly Crewe. I must invite everyone to the unveiling of the statue... but if it needs to be unveiled, it needs to be covered up... oh no, what a to do! Bother, bother, bother. How will anyone cover the statue now? Nobody will come to the party. Ugh." Tilting his head out of a mix of shock and confusion, Crewe smiles. "Don't worry. Telemakos can fly up and cover the statue, and my builders can help him seeing as not all the scaffolding is down yet. You just stick to planning the rest of the party. I'll get you that raven." It is a miracle that the girl has survived on her own till now, but survived she has, and under the encouragement of others, she will flourish. Something is happening... Undina is hosting a party to unveil their new statue of Terra! Anyone is welcome. There'll be food, dancing, and most importantly, booze! Please post as though your character has received an invite from a raven! As the horses approach, they won't be able to see what is behind the cloth, so the actual unveiling will be a complete surprise! Gemi and Ni were out and about exploring the new world of Mythos when something glass – most definitely fragile glass no less- was dropped at their feet. It hit the ground with an almost earthshattering CRACK! noise and it rolled to a stop at Ni’s hooves. The black and gray stallion sniffed skeptically at the item, his head recoiling quickly so that it would not touch him further, should it be dangerous to them somehow. The proffered item in question was a message in a bottle in both the literal and figurative senses of the phrase. It was a small corked bottle, and thankfully remained unscathed with a piece of paper inside. A raven with dark feathers and a shiny beak had been the messenger of the message. She was flapping her wings over the twins’ heads, and decided that the best way to get their undivided attention was to simply drop the bottle before them. And it worked quite effectively, for it instantly silenced even the chattiest of Gemis. She was midsentence when the bottle hit, and her words were cut short in surprise. Her amethyst colored eyes widened a bit before she too moved to inspect the bottle further. “What is it, brother? Is this meant for us do you think, or someone else?” Gemi asked, speaking in hushed tones to her conjoined sibling. Things just did not drop from the sky where they were from, and this was a new experience certainly. One wrong move to the right and one of them would have gotten hit in the head by falling crystal drinkware. The raven squawked once, her beady black eye trained on the pair of them intently, just daring them to open the bottle. She then proceeded to land on Gemi’s left shoulder, as if to make her meaning clear that their knowledge of the message was intentional. Ni’s prior skepticism remained, but it abated slightly enough for him to uncork the bottle and set it upright. He pulled out a note from inside with his teeth, and his red eyes scanned over the elegantly written script that was the party invitation. ‘You are cordially invited to attend a royal gathering in Undina…’ it began, followed by the date and time they were expected to arrive. The strange thing was was that they did not know anyone in Undina, why were they being invited there? It was not specifically addressed to them, but the raven seemed rather insistent upon their attendance anyways. “Gemi, I feel like we should be careful in accepting random invitation bottles from ravens, especially when they almost hit you in the head with them,” Ni said. He scowled a bit at the raven, which proceeded to caw loudly at him in response. “I know it seems a little strange to you, but Ni, this could be our chance to meet others. We have been alone for a while now, and as much as I enjoy your company, this could change that! If all goes well, we could have a permanent home with others. We could use our powers to do good things like we have always wanted! And it is taking place in a kingdom; surely an entire kingdom we have no ties to wishes us no ill will, right?” Gemi said. The gray woman knew all the right chords to strike with her brother. She knew that it had only been the pair of them for a bit and they both desired to do something greater. It was easy to soften Ni when Gemi knew the proper keys to play. And she knew which ones more often than not. “You are right Gemi; this could be our chance to make an impact. Besides, I always have your best interest at heart. I could not let you go alone to this even if I wanted to,” Ni said replacing the paper in the bottle and recorking it. He nodded once to his little sister and the raven took flight. It pulled at the stallion’s mane with its beak and talons, urging him in the right direction to go towards the celebration. Gemi was obliged to follow. They actually were not too far off from where they stood in the beginning, and it would only take a few hours to get there. The pair of them set off together, and the raven went on about its business to deliver more invitations apparently. “Glad you agreed with me, brother. Who doesn’t love a good party?” Gemi said as she walked towards Undina. “I can think of one particular stag to fit that description, and he is walking right next to you,” Ni responded sourly, though the undertones in his speech patterns hinted at humor. Gemi caught her brother’s joke and chuckled lightly, her tail swishing behind her frame. As opposite as the twins appeared to be in both appearance and personalities, there was no greater bond than theirs. The thing about being attached at the hip with someone is that you are attached to the hip with someone. Their ins and outs become your ins and outs regardless of your thoughts on the matter. Gemini always got along with only the occasional true disagreement, and even that was settled within a few minutes, tops. When they reached the Undina territory, they were amazed at what they saw, and it was only the very beginning. It was safe to say it wasn't every day that Pierre received party invitations from ravens. In fact, to be honest, he'd never received anything from a raven before - much less a scroll of paper in a glass bottle. Clumsy as he was, the shetland decided the best way to retrieve the paper and read its contents was to smash the container onto the ground in front of him. He had been minutes away from crossing the border between Zephyr Ravine and the Mirrored Sanctum, and the shards of glass splintered over grey rock, narrowly avoiding the delicate skin of his fetlocks. Of course, it had occurred to the pony that he could just uncork the bottle and retrieve the paper that way, but he was far too clumsy to do that without breaking the thing anyway. The first few words on the paper were enough to elicit an excited "Woohooo!" from the stallion as he discarded the invitation entirely and began to gallop excitedly towards the glass palace. He was, of course, familiar with Queen Nausicaa - if only for the introduction courtesy of his best friend, Benji - though it didn't cross his mind that he might've needed the invitation to be able to enter the party. In fact, he didn't even know if the party was today, but figured he could hang around the Queen's headquarters until the festivities. He was charming enough to at least be allowed to sleep on her polished floor, non? It was only when Pierre was halfway to the Sanctum that he realised he was completely empty...hooved? He slowed his gait thusly and sighed, spinning on his hindquarters and barrelling all the way to The Metropolis to purchase two bottles of fine wine - one fizzy, one a rich hue of purpled crimson - and a basket of decadent golden pies. He held his wares in the same carrier, teeth firmly holding the handle in his mouth, and lurched back in the direction of the realm of Undina. When Pierre finally reached the Queen's home, he set the basket down in front of him and barely managed not to collapse immediately to the floor. His barrel heaved as his lungs drank greedy buckets of air and sweat glistened off his coat. Of course, Pie's first thought was not how repulsive he must look, having arrived to a fancy event drenched in sweat and panting profusely, but how delicious the pies in the basket - still warm - smelt. How on earth had he managed to cross the entirety of Mythos without sampling even one? That was surely his greatest achievement yet. Recovered only slightly, Pierre spotted Nausicaa and headed off towards her with the basket clasped in his jaw once more. He set it down in front of her and flashed a dazzling grin. "M'lady," he greeted joyfully, wiggling his ears, "Long time no see - I brought you a gift, although..." the stallion inclined his head as if deep in thought, "I'm awful tired from the journey, and I might require a taste of one, myself." he chortled. Pie took another moment to think in silence before dropping his tone and requesting quietly, "I don't suppose you've a fountain or somewhere I could bathe, Naus? The journey was a little...taxing," he twisted his head to glance at the lather of sweat on his wither embarrassedly. "I fear I am not in the best state to attend a lavish party thrown by yours truly, Madamoiselle." Things had been uncharacteristically boring for the brutish stallion as of late, it seemed crime was somewhat hard to fund in this sprawling city. Admittedly he hadn't been trying to hard to find it, preferring to take some time to relax. So much so that was itching to find something, anything to attract his time and attention. He had managed to acquire a decent amount of knowledge from his time reading, as well as multiple headaches from late nights. Lately though even his relaxation was starting to become monotonous. To be bored meant getting into big trouble, something he was ('halfheartedly') trying to avoid. So when a raven landed at his rundown home he took the chance to see exactly what it wanted. When he was able to open the door the creature cheerful placed the bottle at his feet. There was no hesitation when he smashed his large hoof down onto the bottle, shattering the glass into thousands of pieces and crinkling the beautiful parchment. He looked at the crow then, shiny feather catching and reflecting the morning light. Apparently from it's displeased appearance he wasn't meant to be so forceful. He scoffed and moved his eyes to the paper before him. It was clearly very pretty, the words written with care. An invitation, to a Royal party was the last thing he expected. When he looked back at the raven it seemed to be expecting something. The Queen certainly knew what personal service was. He looked at the creature lazily, "Tell your Monarch that I'm coming, or whatever it is that you do." What that he dismissed the creature and went inside, it was time to get ready for a party after all. It had been a long journey to the Monarch party, and Pyross knew the first thing he wanted was something to drink, preferably alcoholic. His movements were relax, lazy even, but he every bit aware of his surroundings. It seemed he had arrived quite early and only a few people were making their way into the building. That and the fact that the marbled structure was tall and imposing meant he was surely in the right place. He had heard a few things about the Monarch here Nausicaa, from what he had learned she seemed to love nature. Something evident form the many flowers and gardens he had already passed. He made his way thorugh the entrance and into the main party and he had to admit, Nausicaa had done well with the palace. It felt open. with natural light streaming through every window, and the many adornments made the space feel bright. He scanned the crowd looking for the nearest bar as well any anyone that might catch his interested. He was just in time to overhear a horse address the Monarch, one with a request to...bathe...in a fountain? When he looked at the source of the voice he was also able to notice another horse, however this one had two heads. He let out a snort, yep, this place was certainly going to be interesting. He moved over to the bar, ordering his favourite drink, whiskey. However, this time it was better, free. If nothing else this party was going to be worth it for the drinks alone. His normal habit was getting expensive. It was a short time before he had taken down two drinks and ordered another, much to the poor bartenders surprise. To ease the poor mans tension he decided to actually spend some time observing the party. He notice the other two horses be had encountered before immediately, but where was the host? He figured he might as well wander, and maybe mingle. Ordering another drink to go. It had been a long journey here, but the violet woman's flagging spirits revived at the sight of the castle ahead, a palace of glass and crystal, sparkling like a diamond in the sunlight. The Mirrored Sanctum - she had heard so much about it, but this was her first visit. The graceful arches of the entry soared skyward, and the halls themselves were spacious, airy, and elegantly appointed. The light sparkled along every surface, giving the place a faintly dream-like look. Estarelle wondered if there were any opaque walls or judiciously placed wall-hangings in the palace, or was privacy non-existent within these crystalline chambers? Palace staff directed her to a large, sumptuous hall. Sunlight streamed in from every direction, glittering along the walls, glinting off of the decorations, and gleaming on the polished furniture. It was so bright and airy that the might have still been out of doors. She paused uncertainly at the doorway for a moment, silver eyes scanning the room. The brightened as Estarelle saw a trio of familiar faces - the twins Gemi and Ni, and the cheerful little Frenchman Pierre, who appared to be bathing in in a fountain? She couldn’t help laughing at the sight of sending sprays of water splashing out onto the polished floors. The other inhabitants of the room were a number of people in similar livery who she guessed must be the attendants, a man at the bar who looked like he didn’t want to be disturbed and, finally, a lovely rose and cream woman - she looked more like a girl really. And yet, she must be the queen of this place, as there was no one else here who could be. Remembering her manners, Estarelle gave the queen a deep bow, but did not approach any closer without being invited to do so. Certainly she seemed a more informal royal than Estarelle had ever met before, egalitarian even, but it paid to be careful with monarchs. You never knew which way their whims might turn. Instead she headed to greet those that she did know. “Monsieur Pierre! Already in the drink I see!,” she said with a little laugh and, turning to the twins she added, “I’m so pleased to see you again Gemi and Ni. The twilight mare took care to give each of the twins a separate bow. They might be conjoined, but they were still separate individuals who deserved individual recognition. "Does anyone know what we're celebrating today?" @Pierre @Gemini @Nausica @Pyross and anyone else who wants to jump in! Not half a day after finding himself stranded on this unfamiliar shore, Caiaphas receives a very unexpected visitor. The swarthy bird alights on a piece of sea-smooth driftwood with an ornery caw. What Caiaphas initially takes to be a piece of jetsam clutched in its claws turned out to be an envelope. He halts, adjusting his wings at his sides and meeting the crow’s impatient expression with his own quizzical one. The crow reaches down with its beak, opens the envelope, and presents the letter to Caiaphas. Caiaphas, for what it’s worth, has never received an invitation from a bird before. He also understands almost none of the words in the invitation – he gets that it’s a party, and the word “Undina” sounds familiar. He gathered from his conversation with the kind man he met on the beach earlier that Undina is the name of this place. “Um…are you sure you have the right person?” he asks, slightly embarrassed – either for himself, or for the bird, he’s not quite sure. The raven regards him with the steady-eyed deadpan of one who is both used to and tired of dealing with idiots. Without answering his question, it flies away, leaving Caiaphas standing, nonplussed, at the high-tideline. His two options are simple and equally unappealing; he could either decide the invitation was a mistake, and continue wandering by himself, or he could accept Queen Nausicaa’s (?) invitation and see whether or not 1) he’s actually supposed to be there and 2) whether or not this is somewhere he might even be able to stay for awhile. It’s got an ocean – he likes that. And the guy who gave him directions seemed friendly enough. He starts walking in the vague direction the raven took off in. Ordinarily he might fly, but his long, slender wings are still a bit sodden from his unceremonious landing. He shakes them out once, presses them to his sides, and continues on his way. He finds the gathering before long. Unfamiliar horses stand around a lavish assortment of tables. It gives him pause to note that none of them have wings – he wonders if perhaps he ought not to have wandered into their midst before his own wings dried, in case a quick exit is mandatory. But they don’t seem like a hostile lot. And one of them does seem to have many extra…appendages, even if they aren’t of the feathered variety. He is acutely aware of being an outsider; quiet, stoic, Other, he slowly pushes forward into the gathering with every introverted inch of him beckoning him to retreat. His amber eyes somewhat longingly find a tall bottle of wine – that would definitely ease the knot of uncertainty in his gut – but he resolves not to partake, at least not until he figures out whether or not he’s welcome here. He quickly casts a glance up at the (presumable) Queen. The politeness drilled into him by his father implore him to go thank her for her invitation and introduce himself, but he’s not convinced that there aren’t some hulking bodyguards waiting in the wings to thrash him should be approach her unannounced. So, instead, he wanders over to small group of horses, dipping his head cordially. “My name is Caiaphas…a raven invited me here, but I think it might’ve been by mistake, because I’m very new on this continent. I came to see what all of this was about, but I can leave if I’m not supposed to be here.” He leaves out the part where less than 8 hours ago he was a tangled mess of feathers washed up on their shore, but the stray bits of sand in his tangled mane and between his damp feathers probably do little to conceal his secret. OOC: First post ever with him ^.^ Still getting a feel. The rest won't be this rambly/long, I promise. The palace glittered in the sun, nestled in the rocky cliff like a gemstone in a massive palm. It seemed to be all crystal bowers and glittering towers, more like an ornament or a confection than a seat of power. Nuria idly wondered how well all that glass and silver would stand up to, for example, a trebuchet. One well placed shot would shatter the walls, leaving a gaping hole in their defenses. Unless the glass had been magically reinforced, or there were other hidden defenses. Not that former general and disgraced royal had either the arms or the desire to storm the palace. It was only the force of habit, ingrained over years. She amused herself working through different scenarios to take or defend the palace against various attack until she was within it's glittering walls. She showed her invitation - couriered by raven no less - to a pair of liveried servants who escorted her in to a large room with a number of people scattered about. In addition to the discreet servers and the unobtrusive but strategically placed guards, there was a gaudily overdressed purple and white woman whom Nuria immediately dismissed as someone's concubine or mistress, there was a cheerful little man in the fountain, the most likely to be the concubine's joh - er -patron, a tall winged man who, despite his size, didn't seem threatening, a pair of unusual twins. By process of elimination, the pink and white woman must be the Queen. She didn’t look like much. Pretty, of course, beautiful, even, but almost child-like in her manner. How had she managed to hold on to power? She’d have been eaten alive back home. Watching the group, she didn’t notice the last person until she almost bumped into him - a large, scarred, chestnut male who carried himself like a fighter. He wore a skull for a mask, giving rather a grim look. @Nausicaa @Pyross and anyone else who wants to jump in! Watching silently as the sheet was placed delicately over the statue, Nausicaa blinked her long lashes in the afternoon sun, drops of sunbeams filtering in through them and occasionally dappling her sight. Though she said nothing, there was a constant smile across her face. These were the moments she'd cherish, and what she adored about being queen. Inside her, a sense of rejuvenation brewed. It felt like her first step towards making something out of her life, as opposed to being the hopeless wanderer she had been before gaining the title of the protector of Undina. For someone inclined to believe in the spiritual side of the world, the first step to protection was to forge a bond with the gods, whether they existed or not. She hoped the statue of Terra would please them. No sooner had she been preparing, the guests started to arrive. Nausicaa could hardly hide her excitement (for she seemingly flickers from being a shiny new queen to a mere child in a matter of seconds), and skipped around suggesting final pointers to the party planners she had employed into her service, asking them to hurry along and finish promptly. The decorations were magnificent, and Nausicaa eyed the handiwork of her decorators. The friezes had been peppered with delicate shells, some pink and some white. Inside the palace, the glass had been specifically cleaned just for this event. In the background, there was the ever steady trickle of water from the ponds that lined the marble floors, and if one went outside, it was replaced by the noise of the ocean beating it's white chest of the cliffs. Most importantly, the air hosted a vibe of warmth and happiness, the buzz of guests flooding in slowly getting louder, like an approaching swarm of bees to a deliciously bright flower. That flower was Nausicaa, who was blooming with pride and content as she stood in the middle of the room, spiralling to admire the decor. The first to approach her personally was the wonderfully enchanting Pierre, a horse she had met only a few times before, but her fascination for the stallion held no end. With his squeals of delight in seeing her, she matched them with her own, leaping from hoof to hoof uncontrollably until he offered her the gift. Gawking at the basket and sniffing the air with a huge snort, Nausicaa let out a ecstatic whinny in response to Pierre. "You never fail to amuse me, my friend! I wasn't expecting gifts, truly, but this just smells so good." Once again she took a glance, and you could almost feel the saliva drooling from her softened maw. "My home is your's, Pie! The water in the centre of the Sanctum is the warmest. Living here is like one big greenhouse... be my guest, take a dip! Maybe take them with you?" She nodded to the twins, Gemini, though she did not personally know their name. Perhaps later they would speak, but she hoped that they would enjoy themselves and befriend many of the guests. "Have a drink, while you're at it!" Throwing the remark over her shoulder as she trotted away, she grinned at Pierre and even shot a glance at Gemini, beaming warmly as she did so. Nausicaa almost ran into her next two guests, who seemed to be discussing something at the bar she'd set up. A little taken aback when a skull greeted her, she shook her head to check it wasn't the alcohol that was causing such a sight. "Hey there, you!" She squeaked, cocking her head to the other side as she took him in. "I'm Queen Nausicaa! It's great to meet you. I love the look you're going for, but I'm afraid this isn't a masquerade. But ooh! That would be such an idea for my next party. Thanks, newbie!" And with that, she was gone, once again offering the woman he stood with a toothy grin. There was no time to stop and chat to everyone! She noticed that Pierre and Gemini had been joined by a gorgeous woman, and she cooed quietly to herself over how she wished she was as pretty as that. Purple had always had a soft spot in her heart. The only horse left was one stood directly in the middle, looking quite confused. When he announced himself, she let out a giggle. Dancing towards him through the sunlight, she grinned when she reached him, standing close enough so she didn't have to shout to be heard (but she's Nausicaa, so she shouted anyway. The excitement was too much.). "Of course you're supposed to be here, silly! Everyone is supposed to be here! This is a party where anyone was invited, no matter who their loyalties lie with. I wanted to celebrate with everybody." Wiggling happily, she bashed herself against the stallion, as though they'd known each other all their lives. "I'm so excited for the unveiling later. That's the main event, you know! There'll be fireworks and cotton candy and the drink will flow throughout the night! So come and join us all, make friends! Everyone here has a different story. I think that's what makes it so beautiful." She mused to Caiaphas, twitching her ears eagerly. !!!! VIEW THE PINTEREST MOOD BOARD FOR THE PARTY HERE! !!!! No actually I tend to do as a please. He gave a devilish smile then, visible beneath the ivory mask. "Ah, but it adds to the fun! I thought people tended to like bright displays. Anyway, I'm not the type to waste my liquor. With that he finished the drink and placed down on a nearby servers tray. He had consumed enough for now, it was time to make something of this 'party' he had found himself at. He was regretting coming already, this had been more conversation that he'd had in weeks. It was already exhausting him. He supposed he should ask the women something in return. I'm surprised you don't have a drink? It makes these things much more bearable. He words were said as if even thought of being here was wearing on him. He needed another drink already. He looked towards where a women seemed to enthusiastically greeting guest, from the look of things he assumed she was the queen. She wasn't a bad sight, pretty, definitely regal looking, but younger than he expected for someone supposedly ruling this place. The castle certainly reflect her nature, bright and cheery. Not something he would ever have though of for himself, but he didn't really care about being a position of royalty or power anyway. Some might call him lazy, not driven but he had watched it corrupt his father. He was still standing next to the mare when the queen came bounding up to them, seemingly in a flurry of activity. He saw her taken in his skull, it was almost funny to Pyross how perplexed by it the Queen was. In another life he might've care. Her works were fast and gone as soon as she was, in rush, she was onto the next person. Was there something about a mascarade? Yeah, that was the 'meet and greet' part, done for him. She wasn't his kind of person. Too friendly, and excitable. People like that always confused him, there wasn't any time to be that happy, especially when their world was almost always in some form of disarray. When he spoke next it was to the mare next to him. "She was something interesting." That was all the though he cared to muster. He wasn't about to explain himself. She would likely be considered nothing to him within the next drink or two. No matter what she had said. tags: @Nausicaa, @Nuria & Anyone else. Now that they were situated within the Mirrored Sanctum lands, the twin pair began to admire their surroundings. Both places that they had been in, Serenity Springs and Mirrored Sanctum, were unique in their own ways and did not disappoint. The springs in Gnomus were very relaxing and had an enveloping feeling to them. The sanctum had a crystalline vulnerability that was clearly a reflection of their pearl colored queen. She held no holds barred when it came to expressing her excitement and mirth. As Pierre approached her and presented her with his gift, a chuckle came from Gemi. The twins approached Nausicaa and Pierre, more than willing to exchange pleasantries with them both. “Thank you for the invitation to your gathering, it is an honor to be here,” Ni said first to the queen. “Yes indeed, it really is. And lo there to you too sir,” Gemi said to the queen and then to almost cherry coated paint man. “We would be delighted to make your acquaintance properly after you feel suitable for presentation. Ni and I would not want to interrupt your bathing though, so please do find us again when you are ready.” With a nod to excuse themselves, the two gray and black horses awaited further instruction and interaction. They talked between the two of them in low murmured voices in the meantime. A familiar voice brought them out of their conversation, and both twins looked to find Estarelle in their vicinity, each reacted in their own ways. When Estarelle bowed to her and her brother in turn, Ni returned it immediately, but Gemi did not. Ni’s gray dipped head tucked near his chest, and his frame bent slightly towards the ground. His reddened eyes closed momentarily before reopening and refocusing on Estarelle. His voice held its usual calm tone, though it was slightly more amiable than was the norm for him. Although he was not the most social creature in the world, Ni was actually somewhat glad that they had decided to come. Party pooping nor cynicism were on the agenda for that occasion. The stallion was able to relax a little bit and just enjoy the gathering. He silently thanked the raven for delivering the bottle to them, though he did not know her exact location at that moment. Hopefully the party would continue as it was, and he could still say that he was enjoying himself at the end of the night. “It is good to see you again also Estarelle,” Ni said at last, “You look well today. Your ankle, it is doing better now, yes?” The stallion dared to let a hint of hope touch his gaze before it instantly retreated again. The last time that they spoke, she had hurt herself in a minor way. As a healer, Ni could not help but inquire after her health. It was just in his nature to do so, though they actually did not perform any magic that day. The only reason that Gemi did not return the bow was because she wanted much more than that from the other mare. The woman rushed forward, brother in tow, and attempted to throw her head around Estarelle’s shoulder in greeting. She considered the purple woman a friend, and although she probably should have bowed back in respect, she felt a hug could be acceptable too. Gemi felt that they were over the formalities portion of their friendship, despite the short period of their knowing each other. Longevity did not always constitute the quality of such matters. Ni confirmed his sister’s initial statement with a shrug of one of his broad shoulders. “Honestly Gemi pretty much tells me where to go. It is a matter of whether or not I can dissuade her from going often times that we make an appearance,” the stallion said. 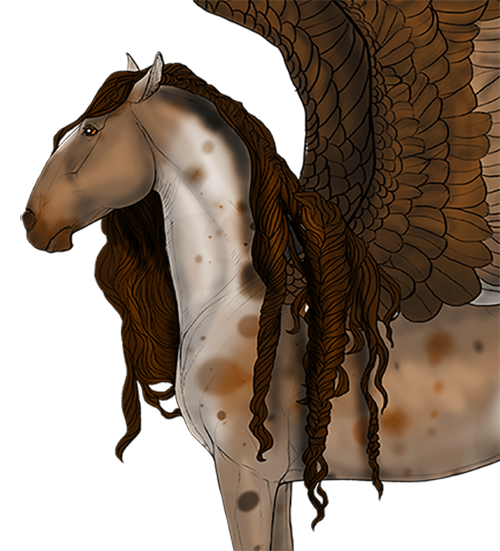 “Although this particular occasion required less persuasion than usually would be required, due to the bird helping her out, and the brilliance of the kingdom itself.” The stag’s glance drifted from one horse to the next, and he wondered what this party would actually consist of. A simple get together would not be opposed, but Ni could not help but feel like there was something grander behind it all. Gemi smirked at Ni a little bit, knowing what he said was the truth. She was the tried and true leader of the two of them, perhaps because of her enthusiastic and eager personality. Ni was not necessarily a follower, but he trailed voluntarily after his sibling because 1: they had not found a way to separate themselves physically from one another and 2: because he could not leave his little sister to her own devices unchecked. That was a surefire way to make Ni worry considerably more than he should, and it would probably keep him up at night.